Wish him a happy Father’s Day with a personalized dedication. 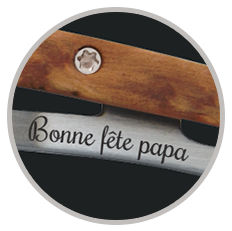 Choose one of 5 fonts to have your personal message engraved on this original Father's Day gift. Get started in creating a unique gift! 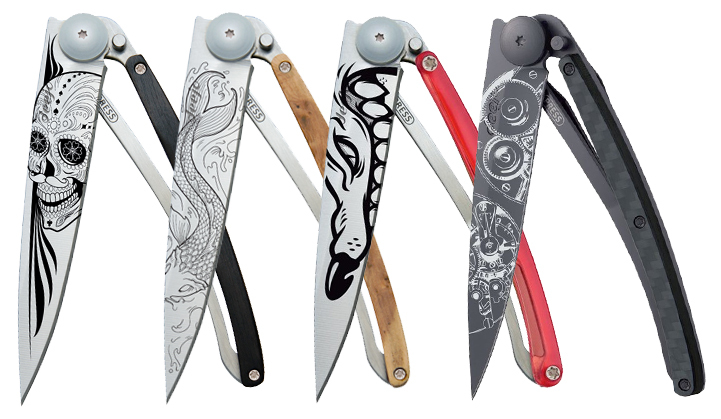 Choose from among 3 sizes of knives, 3 steel finishes, 15 handles, and more than 60 tattoos to create a Deejo knife that belongs only to him. The 37G model is generally the most appreciated by dads, notably for its comfort comparable to that of a table knife. If you have a nomadic dad, consider also our 27G or 15G models, easier to carry for the every day. Select a steel finish: a mirror finish in all its brilliance, a sober finish in matte gray titanium, or go dark, opting for the deep noirs of our black finish and choose a tattoo in tune with the tastes and interests of your father. 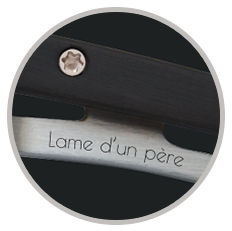 Note that on the mirror and gray titanium finishes, the fine technique of laser engraving we use burns the metal to make the motif durable. 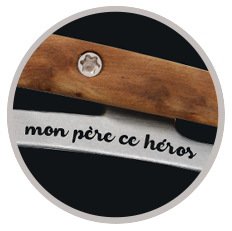 Conversely, on the black titanium models, the laser removes a thin layer of titanium from the blade to reveal the brilliance of the metal tracing the fine lines of your chosen tattoo. Choose a handle for your Deejo: 8 luminous colors to choose from, 5 varieties of wood, or an inert highly resistant composite material, carbon fiber. You can also opt for purity and simplicity by choosing none of the above in favor of our bare model, known as ‘naked’. 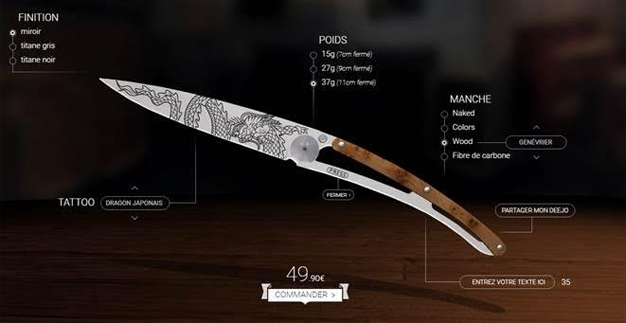 Engrave the dedication of your choice on the handle: choose from 5 fonts with a maximum of 35 characters and an unlimited imagination to engrave a unique message and make your Deejo personal. With a few clicks, down to the smallest details, it has never been easier to make a beautiful gift for Father's Day.